I mean all my smoothies are large, but this one seemed even more valiant than others. It was super sweet, super tasty, and super green; these are just a few of the attributes I find essential in my green smoothies. Since this will hold me over until my early dinner, check out the nutritional stack up below. 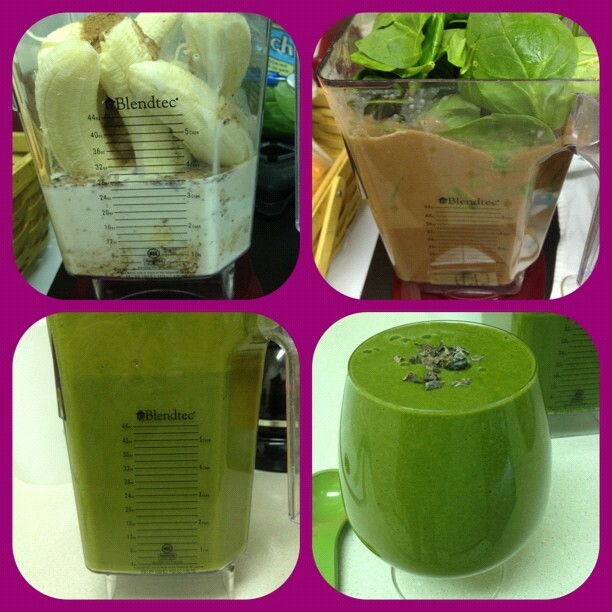 I was amazed at how much fiber and especially protein came from this smoothie. I used loseit.com to calculate that information. Since I didn't eat breakfast today and it was getting closer to lunch, I made this 'large and in charge' smoothie for brunch. The bananas give it all the sweetness it needs and then some and the light chocolate/carob flavor is a nice twist. Feel free to garnish with cacao nibs or even add cinnamon to this smoothie. Blend bananas, almond milk, carob, and chocolate; then stuff (add) in spinach and ice. Blend again until smooth. Enjoy!